Dr. McCracken began his pre-chiropractic education at Wentworth Military Academy Junior College, the University of Minnesota followed by the University of Minnesota Hospital X-Ray Technologists Program. He was selected as Chiropractor of the Year in 1993 for his work on the peer review board. 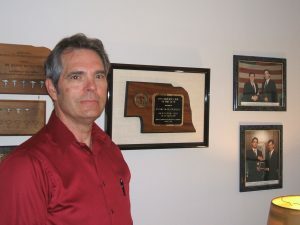 The doctor has served his profession as Chairman of the Nebraska Chiropractic Physician’s Association Peer Review Board a position he was elected to and re-elected from 1983 until 2009. He is currently chairman of the insurance committee. He is one of the founders of Secure Care, a chiropractic PPO with Blue Cross/Blue Shield of Nebraska. Dr. McCracken married Tina in 1971 and they have four children; Megan, Brian, Colleen and Joe. The children are grown and have moved out of the house. Now he and his wife are enjoying grandchildren. While the kids were at home, they received chiropractic care and never any shots or medications; just plain chiropractic. If the chiropractic approach to raising healthy kids is of interest to you, be sure to talk with Dr. McCracken. He likes to play golf, snow ski and go on bike rides with his wife on Lincoln’s many bike trails. Remember, our bodies were designed to be moving, when things stop moving there is a problem. So chiropractic first, medications second and surgery last. A second opinion with Dr. McCracken could save you from a lifetime of pain and suffering. The saying in our office is ” Move Easily, Eat Naturally & Think Positively!